Our shop is located just west of downtown Ellsworth on highway 10. From Red Wing: Follow 63 north to highway 10, and turn right. 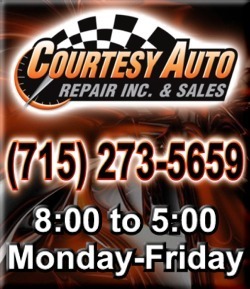 Courtesy Auto Repair & Sales will be on your left. Total distance around 12 miles. From Prescott: Follow highway 10 east almost all the way to Ellsworth. We’ll be on your left just past the intersection with highway 63. Total distance around 15 miles. From River Falls: Follow highway 65 south to Ellsworth, and then head west on highway 10. We’ll be on your right about a mile out of town. Total distance around 14 miles.